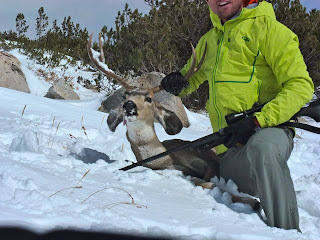 My first backcountry deer hunt. A group of does and fawns head down past Paiute Lake as I head up. If I had known I’d only “hunt” for about four minutes, I wouldn’t have carried twenty pounds of camping gear five miles to Paiute Pass and back. If I had thought to sharpen my knives, it wouldn't have been so hard. As it was, I did much of the dressing and butchering with the 2" blade on my tiny Leather”boy” tool. If I had known it was possible to quarter a deer that was lying on the ground, I would have done that right there. As it was, I first carried the intact deer strapped poorly to my backpack. What a sight, I'm sure; legs and antlers flopping over a brightly clad skinny dude staggering through shin to knee deep snow. Luck? I spent a grand total of about eight minutes in my permitted hunting zone. I picked from a group of twenty deer, all of whom were so focused on getting east and out of the snowy high-country that they milled around looking for a way right past me. I don’t know how many deer migrate over Paiute Pass each fall, but I happened to be in position to see well over thirty of those that were making the trip this year. This alone would have been notable. 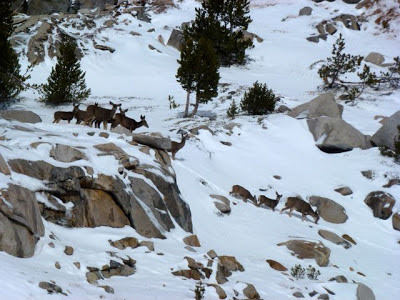 The High Sierra is not known for high concentrations of wildlife. Paiute Pass from the East, with deer almost in their "safe zone"
If I had known how easy it was to drag a deer on the snow, I would have done that sooner. It was indeed easy to drag the deer on smooth snow. However that smooth snow was limited, what with rocks and brush sticking up and the trail twisting through it all. All this initial transport was basically just to get the deer to a tree tall enough to hang the deer from. I shot mine at 11,400 feet, up where "trees" are little more than shrubs. Given my ignorance of "horizontal" deer cutting, I needed a tree. In fact, I thought little of it. It wasn't until a family of horse-mounted hunters came by and commented on how far I had dragged him, that I realized how hard I had worked to get the deer those 2+ miles down into the trees. Cutting a deer up with a tiny multi-tool and then dragging him for over 2 miles represents a laughable convergence of ignorance and brute force.